Building a house takes a LOT of work, a LOT of time and a LOT of effort. Even if you happen to be an Architect (I am), draw your own plans (I did), know your contractor really well, (I do) and think you know how to handle all the details (I thought I did). It seems like all I do when I'm not at work is take care of all the details, make decisions, choose products, redesign spaces, etc. And I have a VERY capable wife who seems to be doing most of the work! I could post a link to our website if y'all are interested in seeing it progress. Add to this the fact that I am the busiest that I've ever been at my "real job" and it makes for very little play time. So - I will be back to blogging, full force, I just don't know how soon. I really miss you all and reading all your blogs. I'll be having to catch up on them all when I do get back to it. 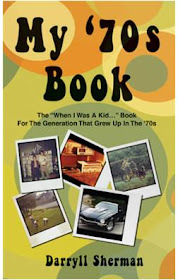 A quick mention (and, of cour se, this should have been done a week ago)... not that I often use this venue to toot my own horn or ply my wares, but the book I wrote "My '70s Book", would be a great Father's Day gift. It's great for a wide range of ages, but mostly if you can relate to life in the '70s. A few of you have read it and have liked it... some have even blogged about it.